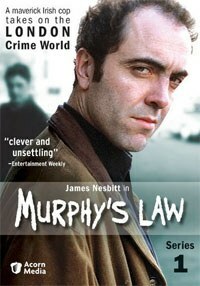 Murphy’s Law stands as a somewhat average crime drama, while its greatest strength lies in its casting of James Nesbitt and Claudia Harrison. The first season of the BBC series Murphy’s Law aired in the UK in 2003, but is just now being released for American viewers. The premise of the series focuses on an Irish cop, Tommy Murphy (James Nesbitt), working undercover in London. He is smart and quick, but guilt over the death of his young daughter fuels his willingness to repeatedly place himself in dangerous situations. Screenwriter Colin Bateman created the role specifically for Nesbitt and wrote three out of the five episodes included in the collection. The series is comprised of a pilot and then four episodes that aired as series one. These episodes are closer to mini-movies than regular series stories. While maintaining some continuity, especially as it relates to the principal characters working with Murphy, for the most part the episodes stand alone. While the series would go on to become more serialized in its later seasons, for now each episode encapsulates one complete story without previous cases or relationships playing an integral role. The pilot offers the most background into Murphy’s career as a police officer. He blames himself for the death of his daughter and has failed a psychiatric assessment. Despite his personal problems, his strengths as a cop still make him a valuable asset to the Murphy’s ability to immerse himself in his undercover assignments completely is his greatest skill. Nesbitt plays Murphy with a great deal of charm and easy humor, a tactic he frequently employs on the job to his benefit. Annie Guthrie (Claudia Harrison) is Murphy’s boss and frequently responsible for keeping him in line. He shamelessly flirts with her and while Annie is not totally immune to Murphy’s considerable charms, she does manage to keep him on his toes professionally. Rounding out the trio working together is Clarke (Christian Burgess), a young and eager officer who often finds himself out of his depth in the company of Murphy and Annie. One of the series’ weaknesses lies in its individualized storylines. Because each episode focuses on Murphy going undercover in a different capacity, the possibilities for tension in earning the trust of those around him is lessened and in turn, makes for less effective conflict. The second episode of the series, “Electric Bill”, is one of the strongest precisely because it gives a more complete picture of the undercover process. Murphy is placed in a prison and must earn the trust of his cellmate in order to solve a crime. His abilities in reading people and blending into his surroundings are at the forefront of this story and it is easier to understand just how good at his job Murphy is when the viewer is given a real glimpse into his working style. In addition to the stand-alone quality of series, there are also issues of pacing and tone. The episodes all run to about 90 minutes in length and they feel too long. For instance, in “Manic Munday”, the story revolves around a championship pool game and the rivalry between an older, more established player, Munday, and his younger competition. Meanwhile fixed games and a run-in with Murphy’s ex-wife all come together in what could have been a much more interesting story, yet the pacing felt slow and at times, just plain off. Unfortunately, because the series is only five episodes, one weak story stands out all the more. Murphy’s Law also employs some strange tonal choices. While Nesbitt plays Murphy as quick-witted and often uses his humor to get closer to the groups he is infiltrating, the sometimes odd shifts to jokes and wisecracking seem jarring and out of place. Murphy’s Law stands as a somewhat average crime drama, at least in its first series. Its greatest strength lies in its casting of Nesbitt and Harrison. They play off one another well and imbue the characters with a likeability that goes a long way in forgiving some of the show’s missteps. While the episodes run too long and the stories often present standard twists and turns, when it does work, as it does in “Electric Bill”, it does a fine job. Unfortunately, the series is often too hit or miss to be entirely successful.